Take some card and glue, tissue paper and gold, paint sprinkle with a little imagination and primary school teacher magic and you have an Olympic Torch. Add an enthusiastic attitude and a desire to encourage everyone to feel part of the Olympics and you have a local schools’ torch relay. This is just what happened in Chobham last week. Six local schools (Holy Trinity, St Lawrence, Woking High, Sythwood, Horsell Junior, Horsell Infant & Goldsworth) planned a route that joined their schools together, using footpaths, main roads and small country lanes. They relayed in teams of four pupils from the primary schools plus a contingent of secondary students from Woking High. These are dedicated students are regulars at St Lawrence’s as they help out with sport on a regular basis., little knowing what capers they would be involved in. The young people were also accompanied every step (sometimes walking sometimes at a trot) by staff and helpers, taking turns to carry their torch the length of the route. 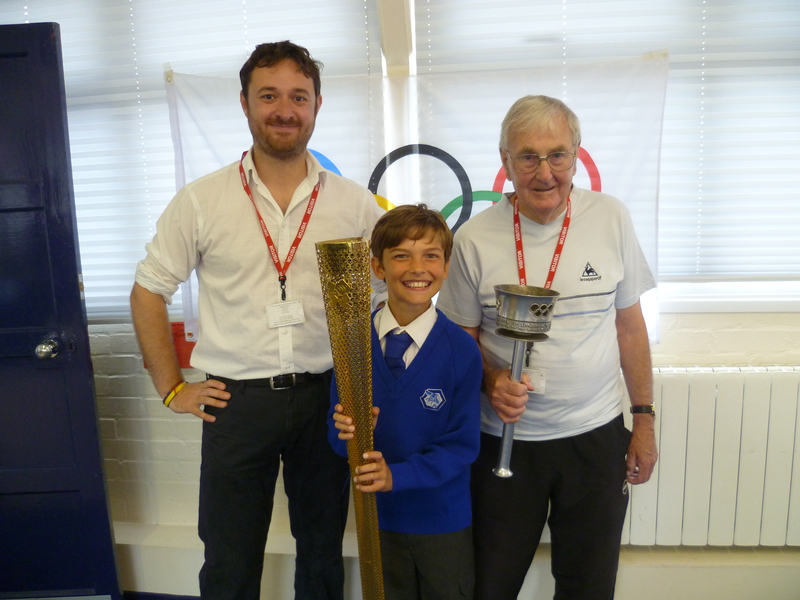 At each school they paraded the torch and it was passed from hand to hand so every child felt its magic. Many of the paths had become overgrown since the route was walked by teachers a few months earlier and so several photos show peculiar and original running styles as elbows and thighs are lifted high out of the reach of stinging nettles – not that this dampened the enthusiasm of the runners one jot. Only one contingent of the relay managed to lose their way, emerging from the fields several hundred meters from the correct changeover point. Such was the precise timing and planning for the event, the mislaid team was found very quickly. I was delighted to be invited to ‘report’ on this adventure, and also to a special school assembly at St Lawrence, Chobham school, to celebrate its success. There were two far more important guests who had really exciting things to share, and I was as entranced as the children to hear about the exploits of James Toney, our local torchbearer who had completed his 300 metre run on the same day as the school event, and also, John Green, a torchbearer from the 1948 Olympics who had run a much more tiring 2.5 mile leg. John had many tales to tell, but most important for the first few minutes was the comparison between the 1948 torch and the 2012 model. We learned about the different fuel types – a gas canister for today’s torch, and a lump of solid paraffin for the 1948 version. While the modern torch was turned off at the end, John smilingly related having to plunge his into a bucket of cold water to put it out. Similarly, the difference between the parade was as marked as the contrasting fuel issues. James told of 400 staff and helpers who make the relay happen in town after town, including 17 policemen who have trained for 2 years in order to provide security for the flame, several minibuses to transport the full contingent of runners for the leg and a party later in the day for all runners and their families. John said he was followed by one motorcycle policeman, and, at the end had to find his own way home by public transport. James had a full ‘kit provided while John, having been asked to run in something white, had to borrow a pair of shorts from a footballing chum as he only had one pair, his athletics shorts, which were red – he was a cross country runner and GB steeplechaser representing Reading Athletics club. There were two areas of common ground however, the first being that the flame from which the torches were lit is kept alive in a miners’ lamp. The second was the emotion that each of these men showed as they talked of their experiences. Each mentioned the humility they felt, the pride and the passion of their Olympic involvement and the fact that never, ever would they forget the experience. Following the assembly was a lively question and answer session. The thoughtfulness of the questions asked, and the forest of arms stretched ceiling high in order to be able to speak bore testament to the real impact this whole experience had made on the pupils and to the fact the London Olympics is as real here, in Surrey to these children as it is to the elite athletes who are about to take part. This entry was posted in BT Olympic Storyteller, London 2012, Olympic Torch Relay, Olympics, Surrey, writer, writing and tagged 2012 Summer Olympics, BT Olympic Storyteller 2012, Chobham, James Toney, Olympic, Olympic Flame, Olympic Games, sport, Surrey. Bookmark the permalink.